I was doing some what I heard once called AFTK (away-from-the-keyboard) writing the other day—some of you may just call it ‘spacing out’—and as I thought about a particular story idea, I realized I needed a certain type of minor supporting character. As luck would have it, I had already created such a character for a different story that would fill the role nicely; the two stories were set in the same town, so it was perfectly plausible. I thought that was neat, having a little thread connecting two stories. Then I started thinking, and realized that I’ve either already done that or had planned on doing it in almost all my longer stories. I know they were conscious decisions on some level, but it was never anything I really put a lot of thought into. It’s not just a little easter egg to myself (or my eventual readers, someday), there’s some actual benefit to it. Once you create a character you like (and manage not to kill them off), it makes it a little easier to put them into a story because you already know them. Their backstory, their attitude, the way they talk. It provides a depth that new characters may not possess until they’ve been developed a lot further. I’ve been thinking about Elmore Leonard a lot lately. I just started reading his book Freaky Deaky, and for the story I’m working on right now I’m trying to shoot for a Leonardian (did I just make up a word?) vibe and wanted some inspiration. Mister Leonard has also happens to have quite a few intertwining characters throughout his world of cops, crooks and cretins. It adds an interesting layer of depth to his stories if you happen to know the characters from other books. I’d heard once that a lot of King’s characters wove their way through his stories, so I decided to check it out for myself. It’s enough to make your head spin. I honestly don’t know if there’s a single novel of his that doesn’t cross over with another in some way. Not even just characters themselves but relatives of characters. King has created entire family trees in his universe, even going so far as writing himself into his heralded Dark Tower series (a fact I didn’t know until I started doing the research for this post—I really have to read that series). 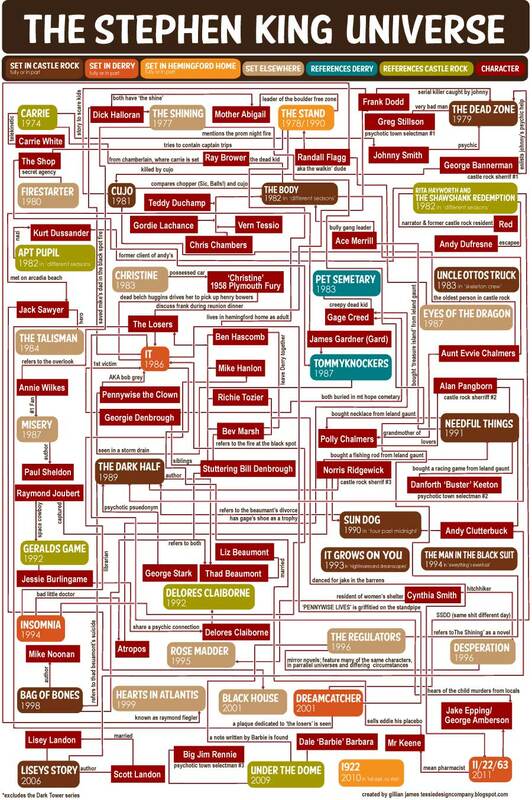 If you have the time are awake and alert enough to try and follow it, click here to see how his characters, locations, and more intertwine in this insanely detailed flow chart. Do any of you find yourselves going back to characters like they’re old friends you’re going to visit for a spell? Are there books or authors that bring in characters from other works that especially tickles your fancy? 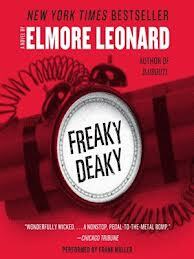 This entry was posted in Books, Writing and tagged character, Elmore Leonard, plot, Stephen King, Writing. Bookmark the permalink. Just a word of warning about the Dark Tower series – it starts off really well, but just gets progressively worse. The first book is great, the second book is pretty good, the third book is not bad, the fourth is meh, the fifth is not great, the sixth is drivel and the seventh… well, it was too bad for me to even finish. It’s a project he put down and picked up again and it is so evident in the later books that he forced himself to complete it! That’s really good to know, because that’s a little out my sweet spot. Now I don’t feel like I’m missing so much.